From as far back as the Odyssey, through the Rhyme of the Ancient Mariner, to the adventures of the Nautilaus in Twenty Thousand Leagues Under the Sea, tales of the oceans and their mysteries have attracted readers. Movie versions like A Perfect Storm have enthralled and horrified viewers with the immense power of the ocean and the hubris which make sailors battle its mighty strength. Now writer Quentin Casey has added another tale of loss to the canon of sea lore. This non-fiction book tells the tale of five men who sailed out before a storm and remained, despite a warning, to gather their tackle and make the “big” catch. Unfortunately, their boat sank and the five men disappeared—never to be found. 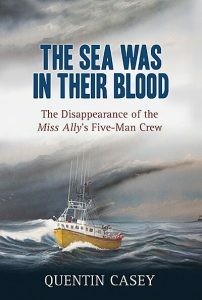 In this CSI investigative book which makes use of interviews and background information, and which draws on the biographical detail of a young but experienced captain, an award-winning journalist has produced a riveting recounting of a modern day ocean tragedy off the coast of Nova Scotia. Curriculum Connections: This book makes a great introduction to biography and the art of investigative writing. Using photos of the principal players in this tragedy, first-hand narrative, and dialogue, the author has created an intriguing read. An advanced reader could certainly appreciate the story, but read aloud in a whole class lesson it could be used to direct young writers to salient points in story construction and narrative tension. I leave it for the reader to write the final epitaphs for Kaitlin Nickerson, Billy Hatfield, Joel Hopkins, Cole Nickerson and Tyson Townsend. This review is from Canadian Teacher Magazine’s Spring 2018 issue.